Sprayed polyurethane foam (SPF) technology has been performing as an excellent means of insulation for over 50 years. When the polyurethane technology was first introduced, it was used as a barrier of heat and cold transfer in refrigerators. Since then, it has become a popular means of insulating a building, keeping the heat inside the building during cold months, and keeping the cool, air-conditioned air from escaping the building during the warm months. SPF Roofing Systems are excellent for a newly constructed roof and also for an existing roof that lacks sufficient insulation. These systems are ideal for avoiding a costly and time-consuming roof replacement when your current roof is not capable of performing as necessary. SPF roof systems are spray applied directly over your existing roof, creating a monolithic, closed cell waterproofing layer with custom insulation, providing excellent resistance to heat and cold transfer. This allows you to reduce cost and energy usage associated with creating a comfortable temperature inside the building. 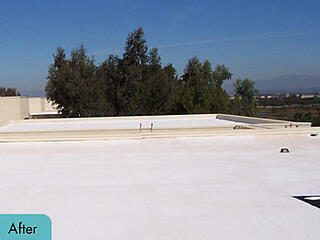 The AcryShield SPF Roofing System is National Coatings’ spray foam system. This system can be applied over BUR, asphalt, concrete, metal, Mod Bit, and wood substrates. Initially the SPF is applied directly over the roof deck or existing roof, a layer of AcryShield base coat is then sprayed on top of the SPF providing a foundation layer of waterproofing with superior adhesion. Next, an AcryShield topcoat is applied, offering outstanding UV protection, longevity and brightness. Our topcoats are formulated to provide superior resistance to dirt pick-up from air borne contaminants, which allows the coating to remain highly reflective. Finally, a layer of RoofGuard Granules may be embedded into the topcoat for appearance, as well as, impact and foot traffic protection. 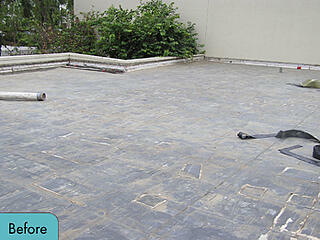 These granules also improve traction across the rooftop while providing enhanced durability. For additional information on improving your buildings’ insulation, waterproofing and more, download our FREE Guide on SPF Roofing Systems. As summer is coming to an end, heat flow from the hot outdoor temperatures will decrease; however, as the colder months are approaching, heat flow from the heated indoor space will begin moving outside. A well-insulated roof system can provide your commercial building with an effective heat transfer barrier. SPF Roofing Systems allow you to reduce cost and energy associated with heating a building during the winter and cooling a building during the summer due to their high R-values when compared with other roofing systems. When a roofing system has “high R-values” that simply means the systems insulated materials have been measured to determine whether the material provides resistance to heat flow. When the testing shows the R-values are high, you know the roofing system has the ability to provide excellent insulation to your building. SPF (Spray Polyurethane Foam) Roofing Systems provide a barrier to prohibit airflow from escaping or entering the building based on their material and application. These systems are spray applied with a two-part system of polymeric isocyanate “A-Component” and a water/Enovate 3000 blown “B-Component” to create a monolithic, closed cell foam. The foam fills and seals any cracks, voids or openings on the roof, preventing heat transfer and delivering excellent insulation and waterproofing to the building. The AcryShield® SPF Roofing Systems are excellent for new construction and restoring and improving the condition of an existing roof. Since these systems are spray applied, they can be installed over aged roofing materials such as BUR, asphalt, concrete, metal, Mod Bit, and wood substrates. 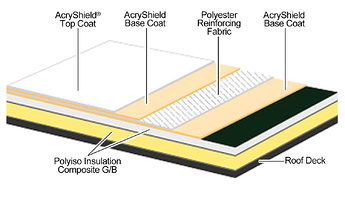 The spray polyurethane foam (SPF) is applied directly over the roof deck or existing roof, a layer of AcryShield® base coat is then sprayed on top of the SPF, delivering an additional foundation layer of waterproofing with superior adhesion while providing resistance to ponded water. Next, an AcryShield® topcoat is applied, offering outstanding UV protection, longevity and brightness. These topcoats are formulated to provide superior resistance to dirt pick-up from air borne contaminants which allows the coating to remain highly reflective for the life of the warranty. Finally, a layer of RoofGuard Granules is embedded into the topcoat for appearance, impact and foot traffic protection. This improves traction across the rooftop while providing enhanced durability. For more information on improving your buildings’ insulation, waterproofing and more, download our FREE Guide on SPF Roofing Systems.